The residents of Durand will be seeing some major construction in 2018. Durand Village President, Bob Corwin and Durand Charm Executive Director, Chris DeSchepper were among those honored to participate in the GroundBreaking Ceremony, April 3, 2018. We are excited to see their growth and welcome the changes. 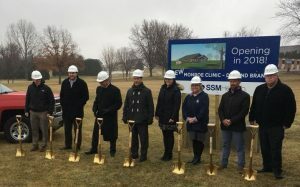 Pictured (L to R) Patrick Loney, Monroe Clinic Management Consultant, Justin Wilchynski, Monroe Clinic President and CEO, Mike Sanders, Coach of Durand Clinic, Katie Marti, Steve Borowski, Chris DeSchepper, Durand Charm Executive Director, Dr. Darrin Pipp and Bob Corwin, Durand Village President. For full story, reference The Volunteer April 11 additon.